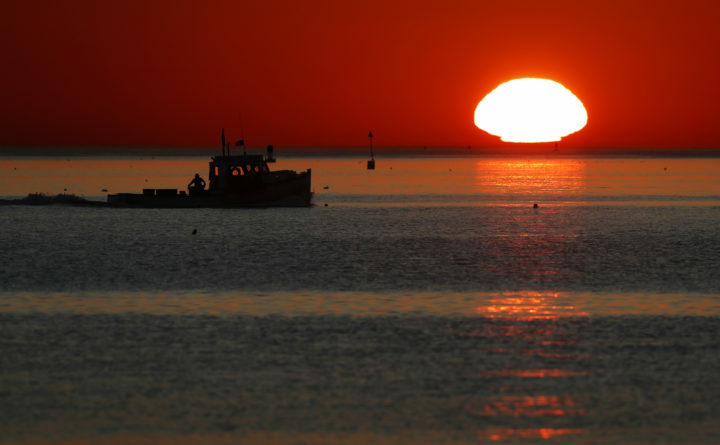 A lobster fishing boat heads out to sea at sunrise off shore from Portland, Maine. The vast destruction caused by Hurricane Florence should focus our minds on the power of nature, the reality of climate change, and what our elected officials have and have not done to address the climate threat. Florence was bigger, wetter, slower and more harmful because of climate change. The science on this is clear. Warming oceans are creating supercharged hurricanes with destructive powers and record-breaking rains that cause more damage and deaths. And it’s not just Florence. Heat waves, floods, and wildfires also are more frequent and destructive because of climate change, and the increasing human footprint is putting more of us in harm’s way. Here in Maine, July was the hottest month on record for Caribou, and August was one of the warmest months ever for the Gulf of Maine, already one of the fastest warming water bodies in the world. We’re now seeing heat waves in our oceans and the arrival in Maine waters of squid, black sea bass and even seahorse normally found farther south. Scientists have been predicting this climate crisis with striking accuracy for decades, but what are our elected leaders doing to address the threat? Not nearly enough. Many are pushing for less action, not more. I put Maine Sens. Susan Collins and Angus King in the responsible class of lawmakers. They value the science, speak about the problem, sponsor constructive climate legislation, and vote against misguided bills that would increase carbon pollution, including methane gas pollution. Rep. Chellie Pingree also fits in this camp, receiving a 100 percent voting record last year on bills to address climate change. But she’s not my representative. I live in Rep. Bruce Poliquin’s district, and he’s been missing in action. He has questioned whether humans are responsible for climate change. He supported the bill to allow an increase in methane pollution, which the rest of Maine’s congressional delegation opposed. Poliquin even recently came out against a fee on carbon emissions. Some Republicans in Congress are showing signs of leadership on climate change. For example, 43 House Republicans joined with 43 Democrats in a bipartisan Climate Solutions Caucus to develop policies to reduce the risk of climate change to our economy, national security and public health. Poliquin is not a member of this caucus. Nor is Poliquin supporting a climate bill, the Market Choice Act, introduced by Rep. Carlos Curbelo, R-Florida, and two of his Republican colleagues. The bill makes a lot of sense. It would reduce carbon pollution 40 percent by 2030 through a price on carbon pollution, ending the ability of polluters to harm the climate for free. The revenues would fund transportation infrastructure, in place of the existing federal gas tax, and provide dividends to low-income families. Poliquin does not support the bill. Instead, he voted for a non-binding resolution in July to condemn the idea of putting a fee on carbon pollution, and then issued a press release proudly announcing his opposition. Throughout my life, I have learned to trust science. As chief biologist at the Maine Department of Environmental Protection and deputy commissioner at the Department of Inland Fish and Wildlife, I saw the cause and effects of science in action every day. I have kept honeybees in Belgrade for 54 years, and my records of temperature correlate with the long-term warming trend presented by George Jacobsen and Fernandez at the Climate Change Institute. And now, science tells us that we need to take urgent actions to address the threats caused by carbon pollution from fossil fuels. Poliquin isn’t doing the job that needs to be done. He’s too closely tied to the fossil fuel lobbyists whose sole purpose is to prevent the world from moving away from fossil fuels toward renewable energy and reduced climate risks. Hurricane Florence shows us that now is not a time for inaction. When voters go to the polls in November, we should vote for candidates committed to addressing climate change — one of the most urgent challenges of our time. Poliquin is not such a candidate. I wish he were, but his inaction on climate change is deeply worrisome. Matt Scott lives in Belgrade. A longtime state scientist, he now lectures statewide on Maine lakes and honeybees.